It’s private property, so please, do not trespass. Not only would it be illegal, it’s also unsafe. The 200-acre mining operation around the residence is a dangerous place to play. There are several counties in the state where the highest point rests in a backyard, and not everyone wants guests. In Monroe County, the most elevated public property (at 820 feet) is 13 miles northwest of Hopper Hills in Mendon Ponds Park. It is on the Devil’s Bathtub Trail. There are approximately 25 miles of hiking trails in Mendon Ponds Park, winding through a unique collection of glacial features that earned the Natural Landmark designation. Monroe County’s high point ranks 51st among the 62 county high points in New York State. So, in terms of height, it’s toward the bottom. 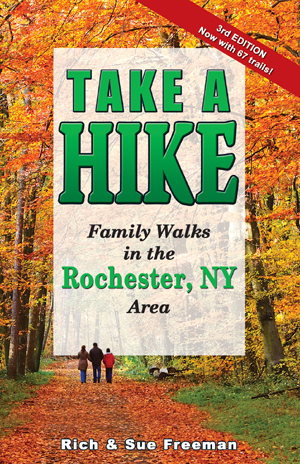 You can hike (or walk) to most of the high points, including the lowest (220 feet high) at Green-Wood Cemetery in Kings County in New York City and the highest (5,344 feet high) at Mount Marcy in the Adirondacks. 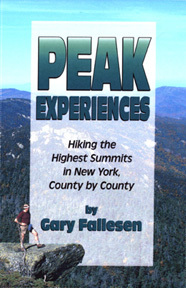 The guidebook “Peak Experiences – Hiking the Highest Summits in New York, County by County” gives all the maps and details you need to explore high places in all 62 counties.